Well, we puzzled long and hard and came up with this idea! – we’ll provide you with two patterns – both a suprise, a mystery partner and you choose the wool you would like for your pair of socks. First of all you cast on and knit the sock for your partner, then you swap and knit the sock for yourself in the second pattern – so you ever only knit 1 sock for each pattern. When both socks are finished there will be a swap day and you’ll receive your second sock to complete your pair! The SALS will start on Saturday 14 October with a big party at C&W. You’ll then have until 4th November to knit your first sock – that should be enough time – that’s 3 weeks! On Saturday 4th we’ll celebrate the finishing of the first sock. At the celebration you’ll receive the wool from your partner, the new pattern and you can start knitting the second sock. In 3 weeks time – 25 November we’ll all meet up again and do the final swap -Yes you’ll have a pair of sock that are ready to wear!! There’ll be lots of support and encouragement through social media and mail outs – you certainly won’t feel alone!! If you don’t live in the area but would still like to take part there will be options to take part by posting the socks to us at C&W. 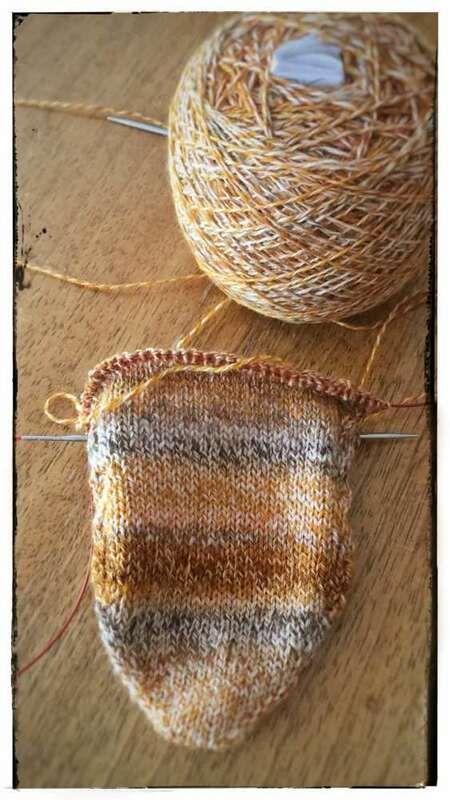 If you can’t yet knit socks but want to learn then we have a sock workshop starting on 16th September and we’re always available for help and tips and tricks. You can follow everything on social media – on our facebook page and on instagram at #crossandwoodsSalS and on our Raverly group!